The first sound recording was not of music. Thomas Edison, being a man of science and not a literary man, and most likely caught out by the fact that the damned thing actually worked, couldn’t think of anything better and recorded Mary Had a Little Lamb on a wax cylinder. While it would be too much of a stretch to call this the first audiobook, it’s only a little stretch to call it the first audio text. This was in 1877, and while soon after a monthly subscription service of War and Peace – one cylinder a month, one page per cylinder, as read by Constantin Stanislavski – failed (the final cylinder was released last week), it would be a long time before the technology caught up with the possibilities. In the first of a long series of obsolescences the wax cylinder was replaced by the gramophone record in the late 1880s. As they were flat, making them much easier to store, and double sided, allowing them to hold more audio, gramophone records were a step towards feasibility for recording entire books. Subscribers to War and Peace who once had to build additions on to their houses (jokingly called the War…and Peace! room by regretful subscribers), now could clear enough space to allow their children to actually sleep in the house. As the first records played at 78 rpm and could hold only 4 to 5 minutes per side, the only audio texts produced during this time were very quickly read collections of haiku and a short lived subscription service for recorded personal ads. It wasn’t until the introduction of the 33 rpm record in the 30s (which didn’t truly take off until the early 50s) that technology existed to make putting a book on vinyl somewhat feasible. The first application to take advantage of this possibility was in the form of “talking books” (ahem) which were mainly intended to give access to literature to the blind. This is still an important application for the technology, and I remember my great grandmother (spoiler alert) getting books on tape in the mail from the Library of Congress after she lost her sight. Some of the first recordings made for this program included sections of The Bible, selections from Shakespeare and The Declaration of Independence. After World War II, the government began an initiative as part of the GI Bill to make textbooks in audio form available to soldiers who had lost their sight as a result of war injuries. As they were newly blind, most of these veterans could not read braille and as a result had no access otherwise to the educational materials guaranteed them under the GI Bill. Given the nature of the material, and the presumably uneven interpretative skills of the volunteer readers, these recordings did not take off with the general public. Finally in 1952 a company called Caedmon Records was formed dedicated to the sale of spoken word recordings. 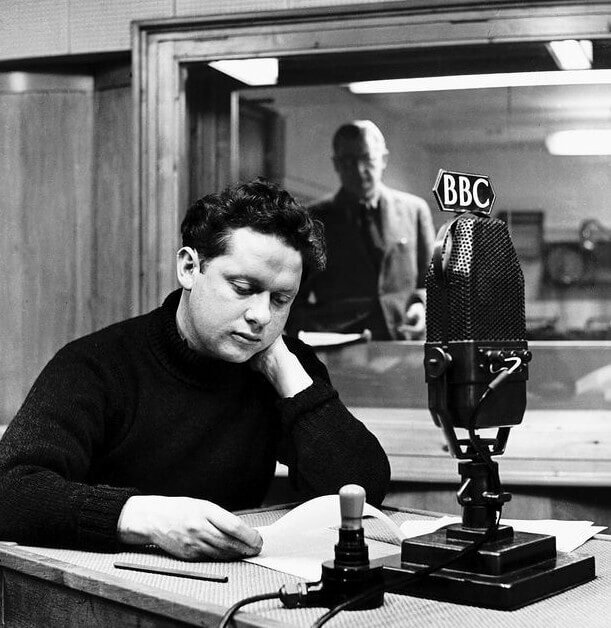 Their first hit was Dylan Thomas’ recording of A Child’s Christmas in Wales, which was a B side added as an afterthought to a collection of his poems, and Thomas actually couldn’t remember the title of the piece when asked what he wanted to fill the other side of the record with (though this shouldn’t come as too much of a shock). It surprisingly launched the company to success. As LPs still could only hold around 45 minutes of audio, it wasn’t until the 1970s, with the growing popularity of cassette tapes, that full length recorded books truly became practical and the talking book of the 30s began to transform into the audio book we know today. With the continued streamlining of technology from cassettes through CDs to digital audio books, the industry has continued to grow and expand. Today, annual audio book sales are over one billion dollars and climbing, though 25 percent of those sales are from duplicate downloads by people who didn’t realize they’d already listened to half of Infinite Jest until after purchasing it the second time. And now behold! The Talking Book is here to grab a piece of that literary pie (and to squeeze some much needed character into its fruit filling), bringing the industry full circle, which is the shape of a pie, and hit you in the face with it, mixing it around with other metaphors until you sit up and take notice (kind of a cheap shot to hit someone in the face with a slice of pie while they’re lying down I’d say). Perk up your ears, the books are talking. This entry was posted in Featured, Lit, Non-fiction and tagged A Child’s Christmas in Wales, audiobook, Dylan Thomas, LP, Mary Had a Little Lamb, Tal Clapp, talking book, Thomas Edison, War and Peace, wax cylinder. Bookmark the permalink.